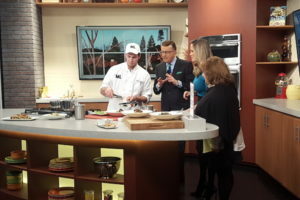 In anticipation of Shop & Champagne at the Birmingham-Bloomfield Art Center (BBAC), Cafe ML Executive Chef Josh Duncan prepares the Braised Short Rib dish. The annual event features a strolling dinner with dishes from other local restaurants, champagne, live jazz and a preview of The Holiday Shop, the upcoming fundraiser to benefit BBAC. Click here to see the Fox 2 Detroit segment.